Shaikh Mohammed at the BBTC Series opening in Manama. The discovery of tight oil reserves in Bahrain will present a new set of opportunities to the kingdom, said Bahrain's Oil Minister Shaikh Mohammed bin Khalifa Al Khalifa. 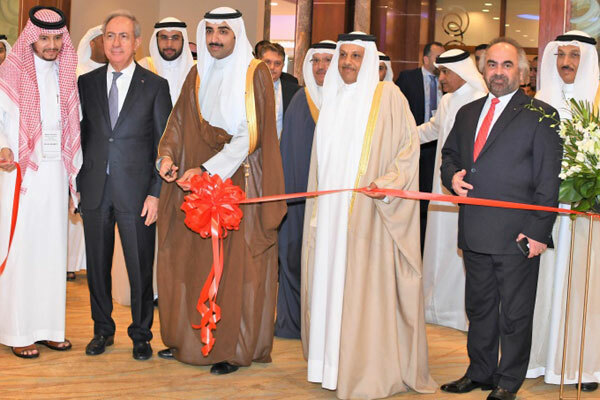 "What is happening in the US in the aftermath of the shale revolution will also happen here," the minister said inaugurating the Bottom of the Barrel Technology Conference (BBTC) series which opened today (December 3) in Bahrain. Top executives from national oil and gas companies and a number of affiliates of Gulf oil companies and engineers from across the globe are taking part in the two-day event being organised by Euro Petroleum Consultants and Bahrain Petroleum Company (Bapco) in co-operation with the National Oil and Gas Authority. The shale oil revolution the US has made available in abundance lighter oil, which it itself presents a fresh set of challenges to the industry, he said. Those challenges will come to the region as major oil companies including Saudi Aramco and Adnoc have started moving in the direction of tapping renewables. Referring to the Bapco Modernisation Programme (BMP) the minister said it is an important milesone for Bahrain and its bid to boost the downstream refining business. The BMP, which is into its ninth month of EPC, is proud to be associated with the best technology providers and equipment manufacturers, he said. The BMP will include a residue hydrocracking unit, hydrocracker unit, hydro desulphurisation unit, crude distillation unit, vacuum distillation unit, saturated gas plant, hydrogen production unit, hydrogen recovery unit, sulphur recovery unit, tail gas treatment unit, sour water stripper unit, amine recovery unit, bulk acid gas removal unit, sulphur solidification unit and sulphur handling facilities. The norm is to put a delayed coker, which is perhaps the best way to go, noted Shaikh Mohammed. Bapco has also chosen the ebullating bed residue hydrocracking process, which provides high conversion of residues selectively to liquid products and high removal of metals, sulphur and CCR from difficult feedstocks, he said. The BBTC Series, being held under the theme "The best solutions to raise the level of petroleum waste," has the backing of international oil companies in the GCC region. Following the launch, Shaikh Mohammed toured the expo and met a large number of officials from different companies across the globe. Shaikh Mohammed highlighted the importance of treating the resid fuel oil, especially in light of the challenges being faced by the oil refineries and the treatment of heavy materials in the overall utilisation of remaining oil from the distillation products. "It is encouraging to see that the theme of the conference is on the topics of improving environment-friendly technologies, such as advanced trends in gaining carbon or enhanced oil recovery in the refining industry," he stated. He also mentioned that the oil refineries are looking for low-cost projects with high returns projects, such as removing bottlenecks and improving the infrastructure, production and competitive products, he added. The minister pointed out that these restrictions pose a challenge to the refineries, which requires planning for what should be done toward the residual oil high sulfate content, which can no longer be combined in the fuel of the vessels, which need oil refineries to work quickly and take investment decisions on the treatment of the residual oil. "The refining industry is witnessing a qualitative shift in the world markets as a result of the recommendations of the International Convention for the Prevention of Pollution from Ships (Marpol) to reduce the proportion of sulphur in fuel for ships, as well as continuing changes in energy demand and the growth of the world economy and the new challenges such as electric cars," he added. He pointed out that the marine fuel also witnessed rapid changes as a result of the decision of the International Maritime Organization (IMO) to reduce sulphur content in marine fuel used in open seas from 3.5 per cent to 0.5 per cent expected to become effective in 2020, said the BNA report. During the two-day event, experts will put spotlight on the legislative and environmental regulations and the most important investment decisions on the treatment of the residual oil as well as the future aspirations to reach solutions to make the remaining oil possible and economically feasible and eco-friendly. Shaikh Mohammed also pointed out that Bahrain had acceded to the International Convention to prepare for and respond to the co-operation in the field of environmental pollution (OPRC) in 1990, according to the Decree Law No. (4) of year 2010.